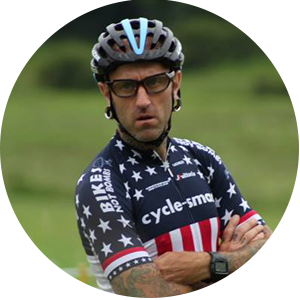 Adam Myerson is a former professional who specializes in criteriums and cyclocross. He is the current Masters 45+ Continental cyclocross champion, 3-time and current masters national cyclocross champion, 2017 masters road champion, and 2018 masters criterium champion. Bookending his long career, he was also the 1997 collegiate national cyclocross champion. He began racing as a junior in 1987 at age 15, and was a professional for 13 years, racing his final pro season in 2015 at age 43. He is founder and president of Cycle-Smart, Inc., president of the New England Cyclocross Series, organizer of the Northampton International Cyclocross, current at-large member on the USA Cycling Cyclocross Committee, former member of the UCI Cyclo-Cross Commission, and former member of the management committee of the International Association of Cyclo-Cross Organizers (AIOC-Cross). He is also a husband and parent. He lives in Dorchester, MA, and is not currently accepting new clients, but is available for camps, clinics, and seminars.